President Recep Tayyip Erdoğan has said Turkey “will not give credit to the language of threats” after the United States administration’s harsh statements over the arrest of pastor Andrew Brunson. “Approaching us with threatening remarks will not earn anyone anything. We displayed the best solidarity with the U.S. at NATO. We were with them in Korea [War]. It will not be appropriate for Turkey that such a language of threat is used while having the highest level of solidarity at NATO. And excuse me but we will not give credit to such a threatening language,” Erdoğan told journalists on Aug. 1. Brunson, a Christian pastor from North Carolina who has lived in Turkey for more than two decades, was indicted on charges of having links with the outlawed Kurdistan Workers’ Party (PKK) and the Fethullahist Terrorist Organization (FETÖ), which Ankara blames for the failed coup in 2016. He was transferred to house arrest on July 25. The U.S. Congress recently passed legislation threatening to halt U.S. sales of F-35 fighter jets to Turkey, despite signed contracts between the countries. “It was noted in the meeting that the threatening language used by the U.S. against our country is disrespectful and unacceptable,” Turkey’s National Security Council statement said on July 30. 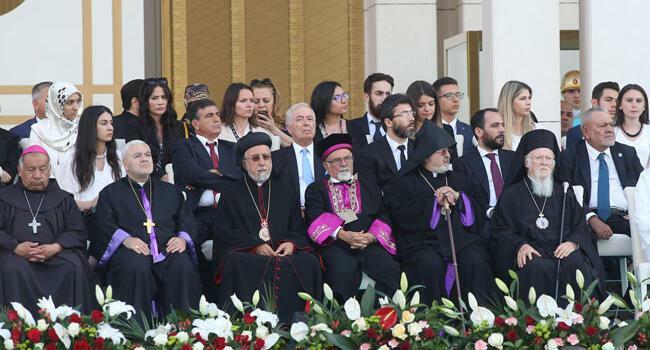 “Statements alleging and suggesting there is oppression toward us are completely unfounded and injudicious,” representatives of Turkey’s religious communities had said in a joint statement, signed by the representatives of 18 religious minority groups, on July 31.